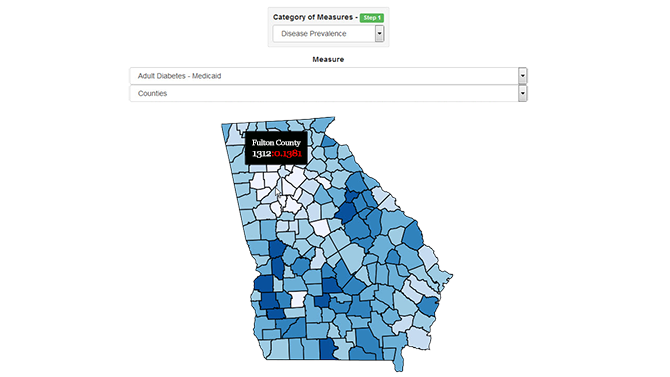 In collaboration with Healthcare Georgia Foundation, we have developed a Data Web Portal for disseminating comprehensive healthcare measures and health determinants available at the community level in Georgia. The objectiveis towards supporting The Two Georgias Initiative, a place-based rural grantmaking program. 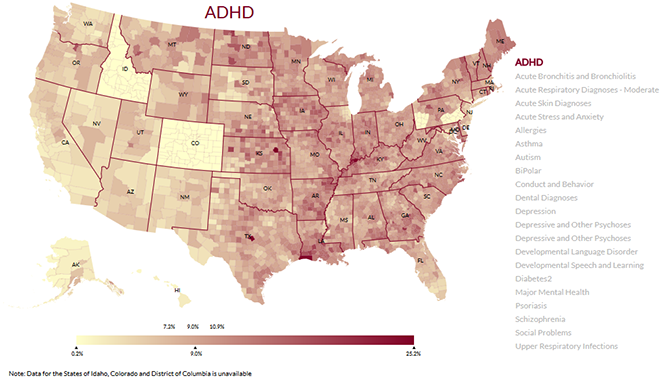 This data portal disseminates in-treatment prevalence of multiple conditions for Medicaid-enrolled children. In-treatment prevalence is defined as the percentage of children in a community that are diagnosed and treated for the condition; it does not include children who are not diagnosed or/and not treated. The prevalence was derived from the 2012 Medicaid Analytical eXtract (MAX) claims data. The data portal was developed with the support of Madhu Babu Adiki, MS student in the Analytics program. Health Analytics at Georgia Tech bridges fundamental mathematical and computational modeling with health services research and health economics as a means of translating health and healthcare data into knowledge and decision making.